The dragon dance is performed by a skilled team whose job is to bring the motionless body to life. The dragon itself is a long serpent shaped body on poles, assembled by joining the series of hoops on each section and attaching the ornamental head and tail pieces at the ends. Traditionally, dragons were constructed of wood, with bamboo hoops on the inside and covered with a rich fabric, however in the modern era lighter materials such as aluminium and plastics have replaced the wood and heavy material. Dragons can range in length from around 25 to 35 meters for the more acrobatic models, and up to 50 to 70 meters for the largest, parade and ceremonial styles, since part of the myth of the dragon is that the longer the creature, the more luck it will bring. The size and length of a dragon depend on the human power available, financial power, materials, skills and size of the field. Its length typically ranges from 9 sections to 15 sections long, though some dragons are as long as 46 sections. A small organization cannot afford to run a very long dragon because it consumes great human power, great expenses and special skills which are difficult to manage. The normal length and size of the body recommended for the dragon is 112 feet (34 meters) and is divided into 9 major sections. The distance of each minor (rib-like) section is 14 inches apart; therefore, the body has 81 rings. History tells us that the dragon dance is performed in various ways, types and colors. Green is sometimes selected as a main color of the dragon, which symbolizes a great harvest. Other colors include: yellow symbolizing the solemn empire, golden or silver colors symbolizing prosperity, red color representing excitement while its scales and tail are mostly beautiful silver colors and glittering at all times which provides a feeling of joyous atmosphere. As the Dragon dance is not performed every day, the cloth of the dragon is to be removed and to have a new touch of ultra-paint before the next performance. The correct combination and proper timing of the different parts of the dragon are very important to make a successful dance. Any mistakes made by even some of the performers would spoil the whole performance. To be very successful in the dance, the head of the Dragon must be able to co-operate with the body in combination with the timing of the drum. For larger ceremonial and parade style dragons, the head can weigh as much as 12 katis (14.4 kg, almost 32 lb). The dragon tail also has an important role to play as it will have to keep in time with head movements. The fifth section is considered to be the middle portion and the performers must be very alert as the body movements change from time to time. In competition performances however, there are strict rules governing the specifications of the dragon body and the routine performed, and so dragons made for these events and what are mostly seen in the impressive stage shows are made for speed and agility, to be used by the performing team for maximum trick difficulty. In these dragons, the head is smaller and light enough to be whipped around, and must be a minimum of 3 kg, the body pieces are a light aluminium with cane and the majority of the hoops will be very thin PVC tubing. Performances are typically made into 8-10 minute routines with an accompanying percussion set. A double dragon dance at Chongqing, China in September 2002 during a week-long celebration of China's National DayA double dragon dance, rarely seen in Western exhibitions, involves two troupes of dancers intertwining the dragons. Even rarer are dances with the full array of nine dragons, since nine is a "perfect" number. Such dances involve large number of participants from various organizations, and are often only possible under the auspices of the greater community. The patterns of the dragon dance are choreographed according to the skills and experiences acquired by the performers. Some of the patterns of the dragon dance are "Cloud Cave", "Whirlpool", Tai-Chi pattern, "threading the money", "looking for pearl", and "dragon encircling the pillar". The movement "dragon chasing the pearl" shows that the dragon is continually in the pursuit of wisdom. The dragon moves in a wave-like pattern achieved by the co-ordinated swinging of each section in succession. Whilst this swinging constitutes the basic movement of the dragon, executing more complex formations is only limited by a team’s creativity. The patterns and tricks that are performed generally involve running into spiralled formations to make the dragon body turn and twist on itself. This causes performers to jump over or through the dragon’s body sections, adding to the visual display. Other advanced manoeuvres include various corkscrew-like rotating tricks and more acrobatic moves where the performers stand on each others legs and shoulders to increase the height of the dragon’s movements. Performing in a dragon dance team incorporates several elements and skills; it is something of a cross-over activity, combining the training and mentality of a sports team with the stagecraft and flair of a performing arts troupe. The basic skills are simple to learn, however to become a competent performer takes dedicated training until movements become second nature and complex formations can be achieved – which rely not only on the skill of the individual member, but on concentration by the team as a whole to move in co-operation. Dunhuang Dance is dances that originated from Dunhuang fresco in Dunhuang, Gansu province, West China. The dances itself is influenced by Buddha images and Buddha religion. Er ren zhuan is a genre of local folk dance and song from Northeast China. It usually consists of two people, a boy and a girl. They sing as well as dance, using folded fans or red square handkerchiefs (which are twirled along as a song is performed) during the dancing portion. It is enjoyed by a majority of uneducated rural people of Northern Chinese before ,and now by more and more educated people all around China mainly because of its funny dialogue has become more than the old dances and songs in one show. Er-ren Zhuan is now becoming better known in the rest of China, thanks to the fact that many er-ren zhuan performers have gone to perform on TV, as well as act in TV serials. Zhao Benshan is the most famous example. Lion dance (simplified Chinese: 舞狮; traditional Chinese: 舞獅; pinyin: wǔshī) is a form of traditional dance in Chinese culture, in which performers mimic a lion's movements in a lion costume. The lion dance is often mistakenly referred to as dragon dance. An easy way to tell the difference is that a lion is operated by two people, while a dragon needs many people. Also, in a lion dance, the performers' faces are covered, since they are inside the lion. In a dragon dance, the performers can be seen since the dragon is held upon poles. Basic lion dance fundamental movements can be found in most Chinese martial arts. HistoryThe story goes that once upon a time a monk had a dream in which there were many sorrows and evils plaguing the land. The monk prayed and asked the gods how he could prevent these evils from occurring. The gods told him that a lion would protect them and fight back the evils. The Chinese people had never see a lion before, but had heard stories that the lion was the king of all the other animals, so the monk combined all the lucky or magical animals he could think of and so made a lion. If you look closely at any lion, you can see a red sash tied on its horn. It is told that the lion was disrespectful to the Jade Emperor. This of course caused the Jade Emperor to get very angry, so as a punishment he chopped off his horn (The source of his life) and the lion died. The Goddess of Mercy (Guan Yin) felt bad for him so she tied his horn back on with a red sash with golden leaves and chanted to the lion and he came back to life. Lion dances can be broadly categorised into three styles, Chinese Northern (北獅), Chinese Southern (南獅), and Taiwanese (臺灣獅). The Chinese Northern dance was used as entertainment for the imperial court and elsewhere. The northern lion is usually red, orange and yellow (sometimes with green fur for the female lion), shaggy in appearance, with a golden head. The northern dance is acrobatic and may include dangerous stunts. The Chinese Southern dance is more symbolic. It is usually performed as a ceremony to scare away evil spirits and to summon luck and fortune. The Chinese southern lion exhibits a wide variety of colour and has a distinctive head with large eyes (of an eagle), a mirror on the forehead (demons are supposedly scared of their own reflection), and a single horn at center of the head (the horn of a unicorn mentioned earlier). 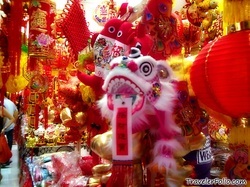 Lion dance costumes are considered to be spiritually protective when used as they are traditionally blessed before usage. The Taiwanese dance integrates with martial arts. The focus on martial arts is very different from the Chinese southern dance whose fancy style is more suitable for circuit shows. In addition to dance steps, the differences between the Taiwanese and the Chinese Southern dances lie in the lion appearance and music. Unlike the Chinese Southern lion whose eyes and mouth can be moved, the Taiwanese lion is less elaborate and can be roughly divided into two categories: open-mouth lion (開口獅) and closed-mouth lion (閉口獅).During the Chinese New Year, lion dancer troupes from the Chinese martial art schools or Chinese guild and associations will visit the houses and shops of the Chinese community to perform the traditional custom of "cai ching" (採青), literally means "plucking the greens", a quest by the 'lion' to pluck the auspicious green normally 'vegetables' like lettuce which in Chinese called 'cái'(菜)that sound like 'cái'(财)(fortune) and auspicious fruit like oranges tied to a "Red Envelope" containing money; either hang highly or just put on a table in front of the premises. The "lion" will dance and approach the "green" and "red evelope" like a curious cat, to "eat the green" and "spit" it out leave it in a nice arrangement, like an auspicious character but keep the "red envelope". The lion dance is believed to bring good luck and fortune to the business and the troupe is rewarded with the "red envelope". Different types of vegetables, fruits, foods or utensils with auspicious and good symbolic meanings; for instance pineapples, pamelos, bananas, oranges, sugar cane shoots, coconuts, beer, clay pots or even crabs can be used to be the "greens" (青) to be "plucked" to give different difficulty and challenge for the lion dance performers. But the difficulties of the challenge should comes with the bigger the rewards of the "red envelope" given. The lion dance, sometimes along with the dragon dance, is also usually performed at many other important grand occasions, including Chinese traditional, cultural and religious festivals, business opening events, birthday celebrations, honour guest welcoming and wedding ceremonies by the Chinese communities. .In the old days, the lettuce was hung 15 to 20 feet above ground and only a well-trained martial artist could reach the money while dancing with a heavy lion head. These events became a public challenge. A large sum of money was rewarded, and the audience expected a good show. Sometimes, if lions from multiple martial arts schools approached the lettuce at the same time, the lions are supposed to fight to decide a winner. The lions had to fight with stylistic lion moves instead of chaotic street fighting styles. The audience would judge the quality of the martial art schools according to how the lions fought. Since the schools' reputation were at stake, the fights were usually fierce but civilized. The winner lion would then use creative methods and martial art skills to reach the high-hanging reward. Some lions may dance on bamboo stilts and some may step on human pyramids formed by fellow students of the school. The performers and the schools would gain praise and respect on top of the large monetary reward when they did well. Nowadays, performances to attain the red envelope are not as rigorous but lion dance troupes still have the onus of making a good show or face the consequence of an unhappy client. During the 1950s-60s, in some areas with high population of Chinese and Asian communities especially the Chinatown in many foreign countries abroadChina in the world; people who joined lion dance troupes were “gangster-like” and there was a lot of fighting amongst lion dance troupes and kung fu schools. Parents were afraid to let their children join lion dance troupes because of the “gangster” association with the members. During festivals and performances, when lion dance troupes met, there would be fights between groups. Some lifts and acrobatic tricks are designed for the lion to “fight” and knock over other rival lions. Performers even hid daggers in their shoes and clothes, which could be used to injure other lion dancers’ legs, or even attached a metal horn on their lion’s forehead, which could be used to slash other lion heads. The violence got so extreme that at one point, the Hong Kong government had to put a stop to lion dance completely. Now, as with many other countries, lion dance troupes must attain a permit from the government in order to perform lion dance. Although there is still a certain degree of competitiveness, troupes are a lot less violent and aggressive. Today, lion dance is a more sport-oriented activity. Lion dance is more for recreation than a way of living. But there are still plenty of troupes who still practice the traditional ways and taboos of the lion dance as it is practiced in the past.